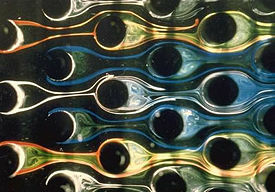 Liquid flow across the tubes in a nuclear power plant heat exchanger. Fluid dynamics, also often called fluid mechanics, is the branch of physics that deals with the flow of fluids, i.e., liquids and gases. It is an adaptation of Newton's laws of motion to a medium that is treated as if it were continuous. That is, the molecular structure of matter is, for the most part, not considered within the science of fluid dynamics. One therefore classifies fluid dynamics as being a continuum theory. Also, in most of fluid dynamics the underlying mechanical laws are taken as those of classical physics, i.e., the effects of relativity or quantum physics are usually ignored. Since the most common liquid on Earth is water, and the most common gas is air, fluid dynamics encompasses the descriptions of water and air, sometimes called, respectively, hydrodynamics and aerodynamics. In fact, one of the major results of fluid dynamics is the understanding that over a wide range of conditions the flow of air and the flow of water can be addressed using the same set of equations from physics. There are unique areas of either subject that require special considerations. For example, the sub-field of hydrodynamics addresses problems having to do with the motion of waves on the surface of a body of water, although a special case of "hydrodynamic testing" evaluates waves in the high-explosive compression system of nuclear weapons. Similarly, the sub-field of aerodynamics (often referred to as gas dynamics) addresses problems involving the compression of gases. Issues of fluid dynamics are addressed by experiment, theory and analysis, and increasingly by computation. The field of computational fluid dynamics or CFD, as it is often called, has grown immensely in step with the increasing power of computers and the development of ever more efficient and ingenious algorithms for flow simulation. Similarly, the field of experimental fluid dynamics employs ever more sophisticated techniques involving lasers and high-speed imaging. Many of the images produced by experiment or computation of fluid flows have great aesthetic appeal. While fluid dynamics may be considered a mature subject, since it has been pursued for several centuries and most of the great physicists, engineers and applied mathematicians have made contributions to it, it still holds many unresolved problems. The problem of turbulence is usually cited as one of the great unsolved mysteries of fluid dynamics and by extension of classical mechanics. While many properties of turbulent flows are understood, a deductive theory of turbulence from the basic equations of fluid dynamics has not been given. Indeed, the phenomenology of fluid flows is considerably better understood, through theory and experiments, than the basic mathematical properties of the governing equations. Oftentimes, the differential equations used to solve systems (e.g., the Navier-Stokes equation) are simplified versions. Physicists and engineers typically proceed with their analyses under the assumption that the basic mathematical equations have the properties necessary to describe a physical system, i.e., that they are well-posed. and have smooth solutions , even though some of these properties have not been proven and present major challenges. The overall study of fluid dynamics also includes: types of fluid flow (laminar and turbulent, viscous and inviscid, Newtonian and non-Newtonian); fluid properties and phenomena; mathematical equations, models and concepts; and applications or usages in fields of study such climate, engineering, geophysics, hydraulics, meteorology, oceanography, superfluids and others. ↑ D.J. Acheson (1990). Elementary Fluid Dynamics, 1st Edition. Oxford University Press. ISBN 0-19-859679-0. ↑ G.K. Batchelor (1967). An Introduction to Fluid Dynamics, 1st Edition. Cambridge University Press. ISBN 0-521-04118-X. ↑ A system of equations is well-posed if it has a unique solution that changes continuously if the initial data change continuously. ↑ A curve or function is called smooth if its derivative is continuous. This page was last modified 04:29, 26 July 2010.